Drill rig sited over drill hole 11-3643-10 and ready to be extended by 200-250 metres to test the mineralized target zone at the base of the Waulsortian limestone. A lovely winter’s day in Ireland! 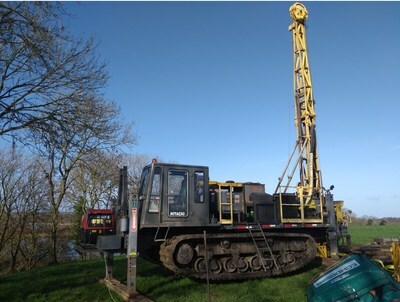 Hannan Metals Limited (“Hannan” or the “Company”) (TSXV: HAN) (OTCPK: HANNF) is pleased to announce that diamond drilling has commenced at the Kilmurry project within the 100% owned Clare zinc project in Ireland after receipt of final drill permissions from the relevant authorities. Drilling has now commenced at Kilmurry, located 9 kilometres south of Hannan’s Kilbricken resource (Figure 1). Kilmurry is a seismic and detailed gravity defined structural and stratigraphic target mapped by Hannan over greater than 15 kilometres strike and 1-2 kilometres width (Figure 3). The mineralized position of the hanging wall of the fault, that is an equivalent setting to all zinc mineralization in the Irish Midlands, has never been drill tested.